Emerald Waterways has held a christening for the latest addition to its growing fleet, Emerald Radiance, which took place on Friday 16th June in Porto, Portugal, with Gill Williams taking the honours as official Godmother. Williams, a UK travel agent with cruise specialist Cruise Village, was selected as Godmother, due to her fantastic support and exceptional sales for the river cruise brand, since launching back in 2013. 2018 marks a busy year for Emerald Waterways, in which the river cruise line has welcomed three innovative new Star-Ships to its expanding fleet. With Emerald Destiny’s christening last month in Vienna and Emerald Liberté’s christening in Lyon set for September. David Winterton, Global Brand Curator for Emerald Waterways, commented: “We’re delighted to have Gill as the Godmother to the 7th Star-Ship in our rapidly growing fleet, and with Emerald Radiance fully booked for the entire year, we look forward to welcoming our guests to such a beautiful part of Portugal. The Emerald Radiance will explore Portugal’s Douro region, navigating the eponymous Douro. The bespoke Star-Ship has been lovingly designed and built to complement jaw-dropping scenery unfolding before the ship’s bow. The ship is the river cruise brand’s most intimate ship to date, with a capacity of 112 guests, paired with the crew-to-guest ratio of 1:3, this low capacity accommodates incredible levels of service. Intelligent deck planning has allowed all of the favourite innovative features from the rest of the fleet, with beautiful flourishes throughout. From generously-proportioned suites and staterooms to the contemporary, chic Horizon Bar and Lounge, ensuring that no aspect of the ship has been compromised by its moderate size. Amongst the brand-new additions featured aboard the Emerald Radiance are the Riverview Suites. Located at the rear of the ship on the Horizon Deck, and boasting floor-to-ceiling windows encasing our innovative balcony; the two Riverview Suites offer amazing, unspoiled panoramic vistas of the river as it flows on by. 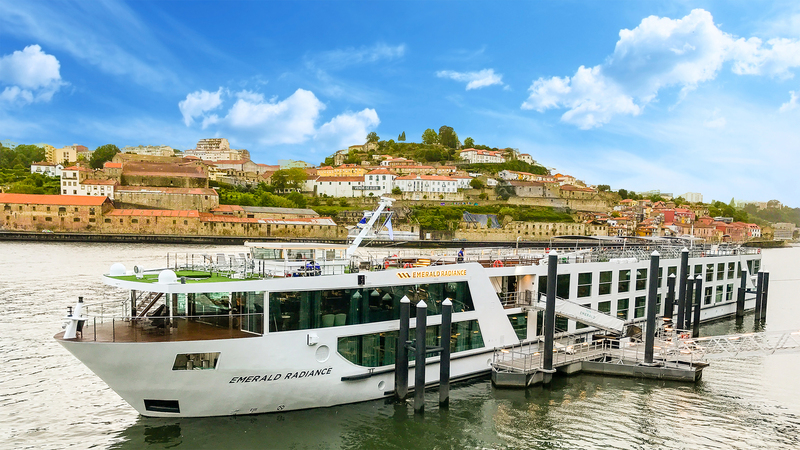 Purpose built for Portugal’s warm climate, the comprehensive Sun Deck aboard the Emerald Radiance provides ample opportunity to sample the sun and gentle river breezes. The open-air aspect of the Emerald Radiance includes The Terrace, the perfect place to enjoy a bite to eat and a drink or two with new friends. Or if you fancy a plunge, the Serenity Pool on the Sun Deck is the perfect place for a few lengths before breakfast, under the beautiful Iberian sky.